Thanks for popping in. Bright and early here! There’s certainly a gold snap in the air darn sarf today. The birds are coming onto the feeders in their droves in the garden. Lots of Nuthatches and goldfinches this year. The Gray Sale has gone absolutely mad. Which is fantastic actually, because we are about to invest in a very expensive piece of kit to enhance production, and now we will be able to do it without borrowing money, whicch I hate doing – especially with the current climate. And I don’t mean the weather! Couldn’t wait to come and chat to you today actually. I just KNOW you’re going to LOVE this…. 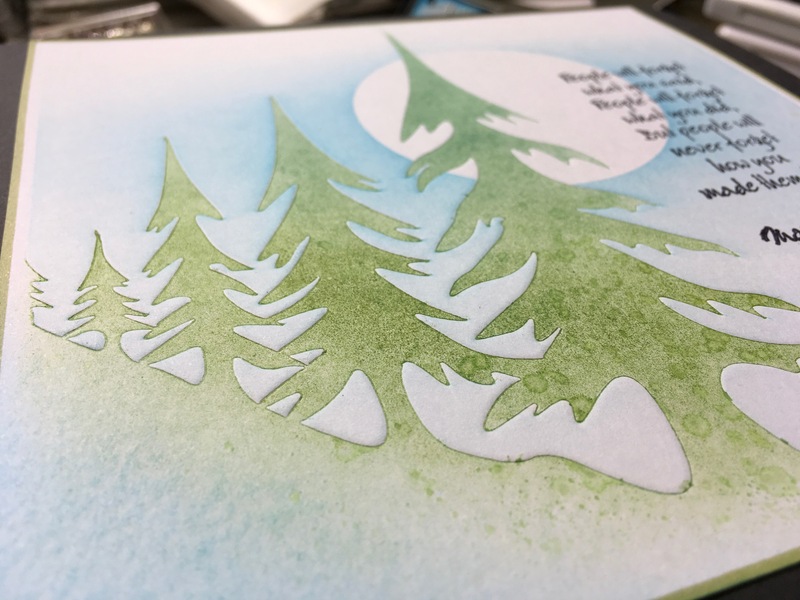 The Sale is still going strong, and just in case you were thinking you could have another looksie, maybe get the stampset you fancied, yes no yes no, resist temptation, sit on your hands…. we wanted to give you another good reason to pop back! 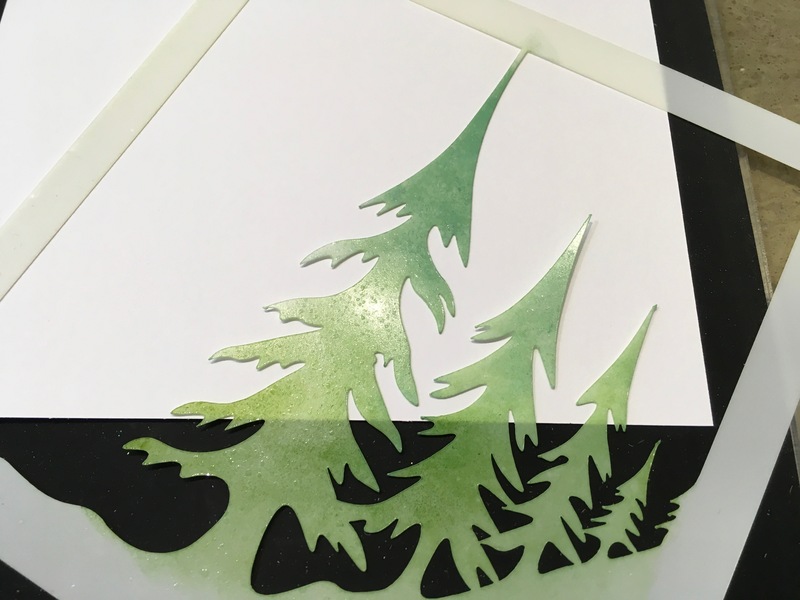 if you go back in to the Gray Sale and spend another £20 before Monday midnight (after discount), we will send you a very lovely, fresh out of the oven, never been seen before, very useful not to mention seasonal Stencil. It’s a beaut! 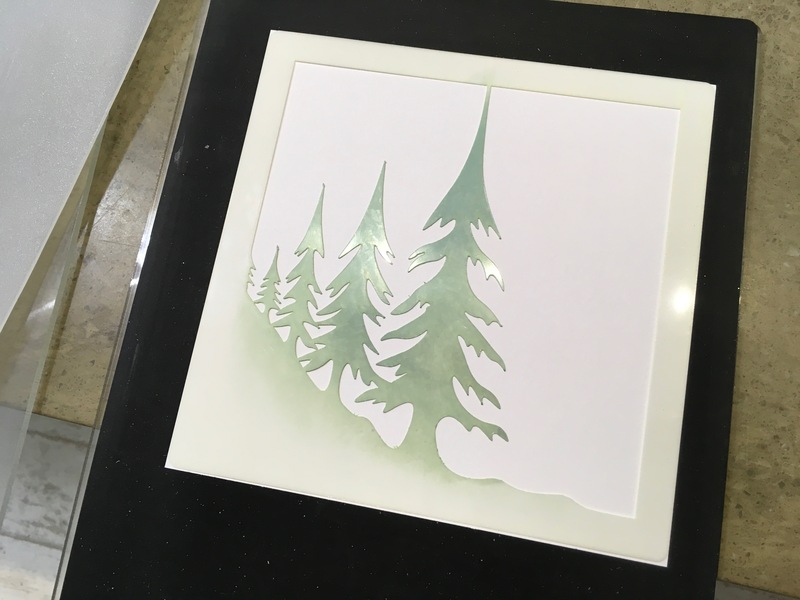 We are calling it Perspective Pines. It’s a 7”x7” Stencil, rrp £4.99. It won’t show up on your order. We will simply include it when we pack your SUNDAY/MONDAY ORDER. And if you were up early today, and have already been shopping, we will include the stencil anyway. I have to tell you, I am so proud of the way we work together at Clarity. On Friday, I decided we needed a special offer stencil for Sunday, just like last year. I asked a couple of folks at work what they thought, and they agreed. So. 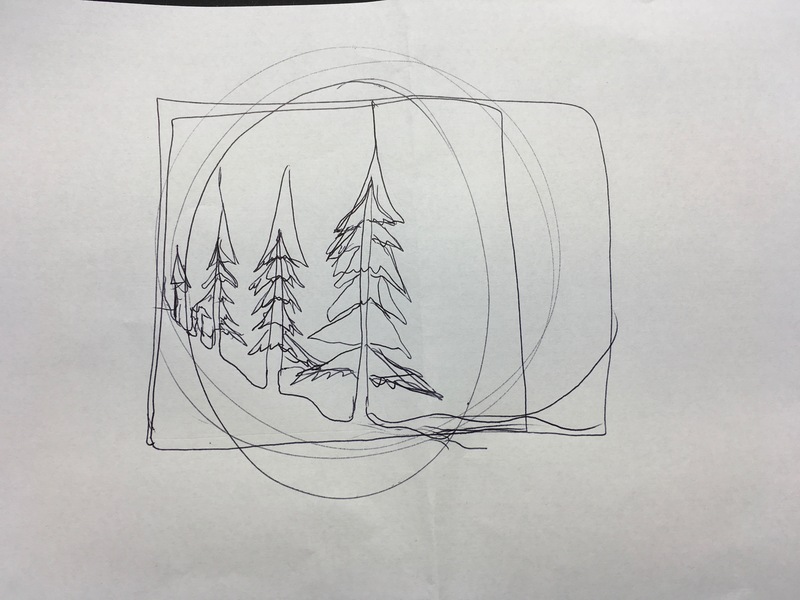 I quickly sketched a stencil design of what was in my head, which I duly sent to Jim, who immediately dropped what he was doing, and turned it into a fabulous stencil. 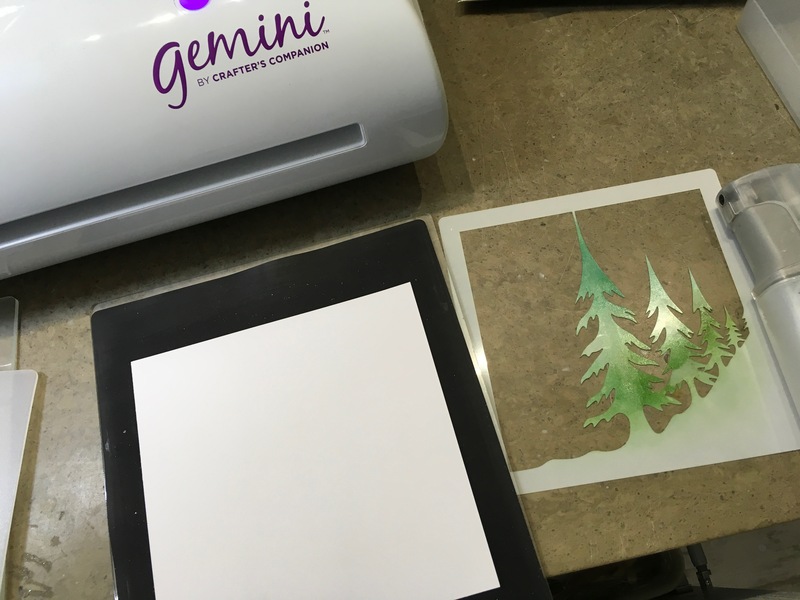 Whilst his Mum Clare – she who is in charge of all Stencil production – started churning out the new design, I took one and made a little step by step project for you. And since we knew from experience last year, that we would need many many hundreds of these, Brother Steve and lovely Lisa stepped in to help, and pulled a long Saturday shift to get the job done. 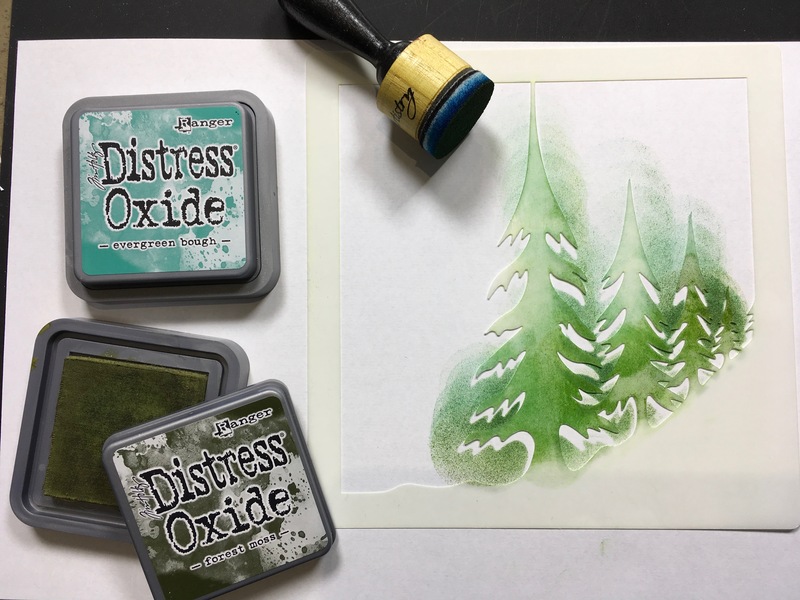 Let’s ink up the stencil with a couple of Distress Oxide pads. We’ll use the blending tools to do it…. Spritz the stencil very lightly with a mist of water. Not too much though. This is going through our mangle now. We just need good pressure, so sandwich between 2 pieces of copy paper. I added a rubber shim, so the stencil embosses too. See? Black rubber shim underneath stencil card? 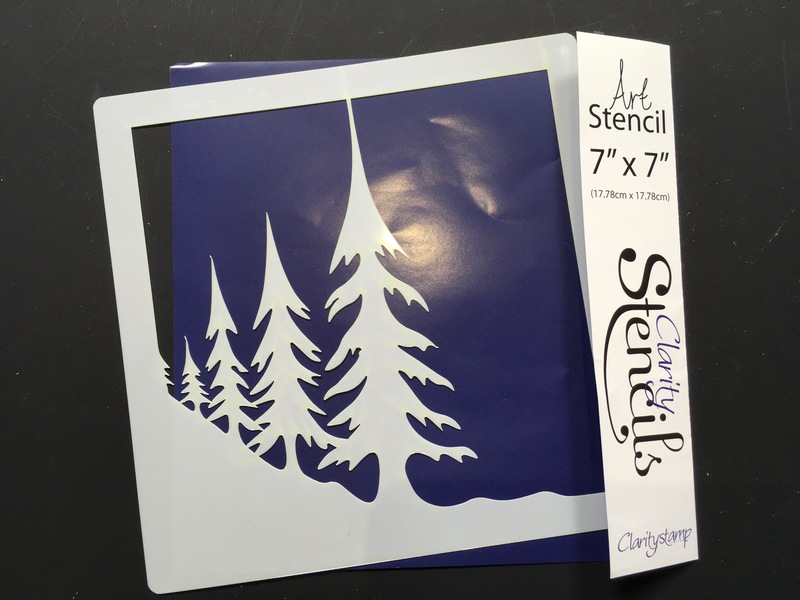 Place the stencil inky side down on a piece of our Clarity Stencil card. It is the perfect 7” x 7” size. Clean the stencil with a little more water and replace on the artwork. Make a hinge at the top with masking tape, to hold it in place. 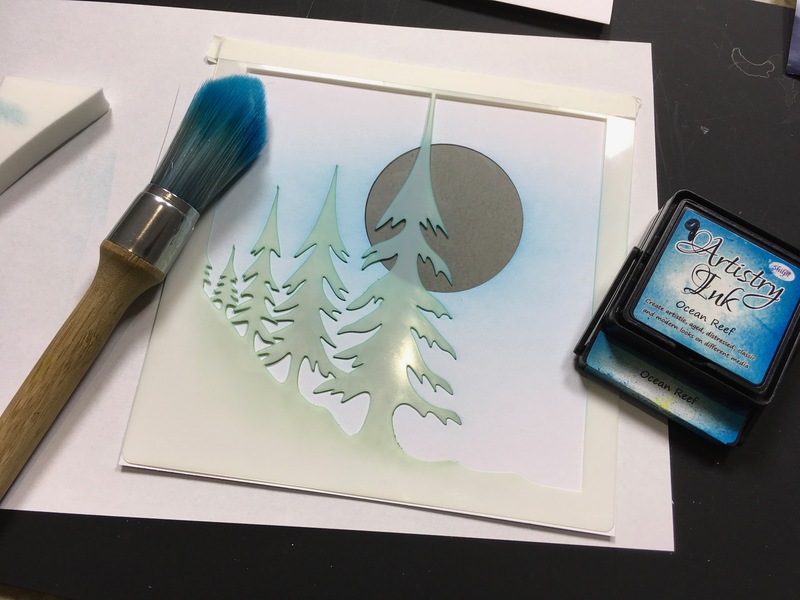 Add a large moonmask underneath the stencil, and brush Ocean Reef, a lovely bright blue dye based ink – into the sky across the moon and the tips of the trees. Lift away the stencil and remove the moon mask. 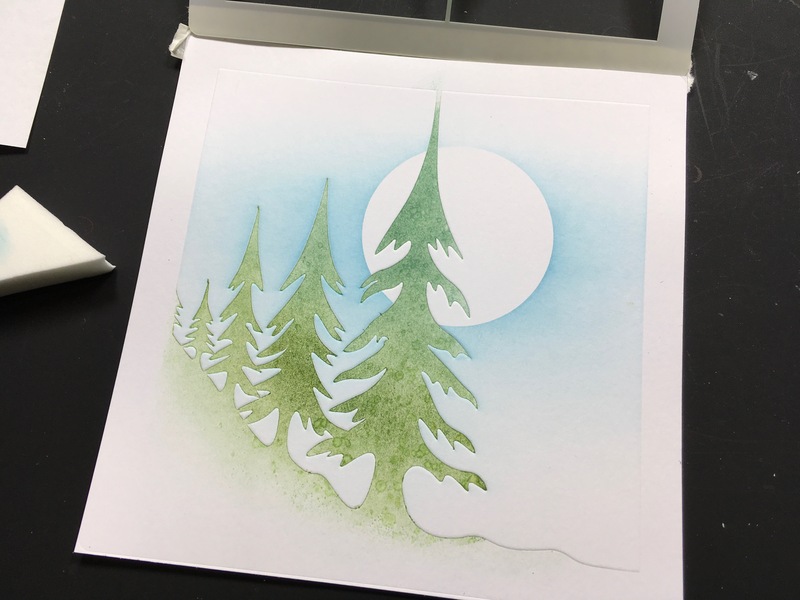 Trim back the card, and run a Promarker of a matching colour around the 4 sides. 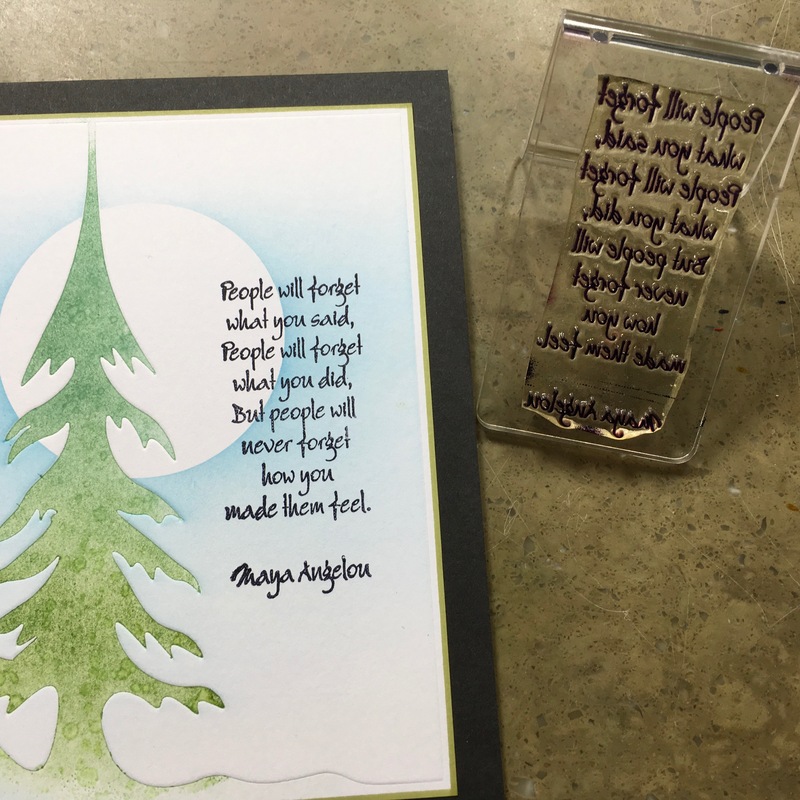 Stamp Maya Angelou’s wonderful words into the space using a black Archival. Mount on a 7” x 7” black card blank. I find the purple Crafters Glue runner excellent for affixing layers. So there you go. 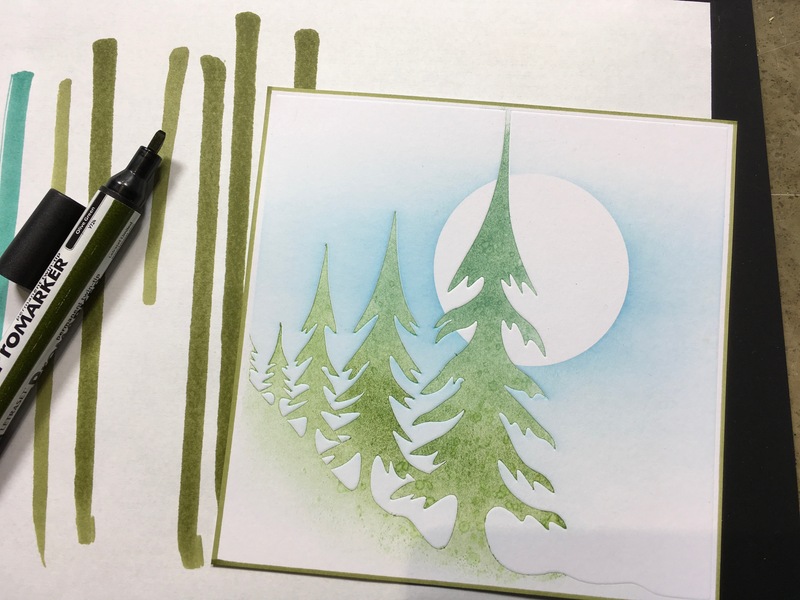 A little how to, showing you how to use the stencil as a stamp too. This is what makes my heart sing. The fact that we can go from this pretty sketchy scribble of mine… (The outer lines were me deciding whether to do an oval, rectangular or square aperture). 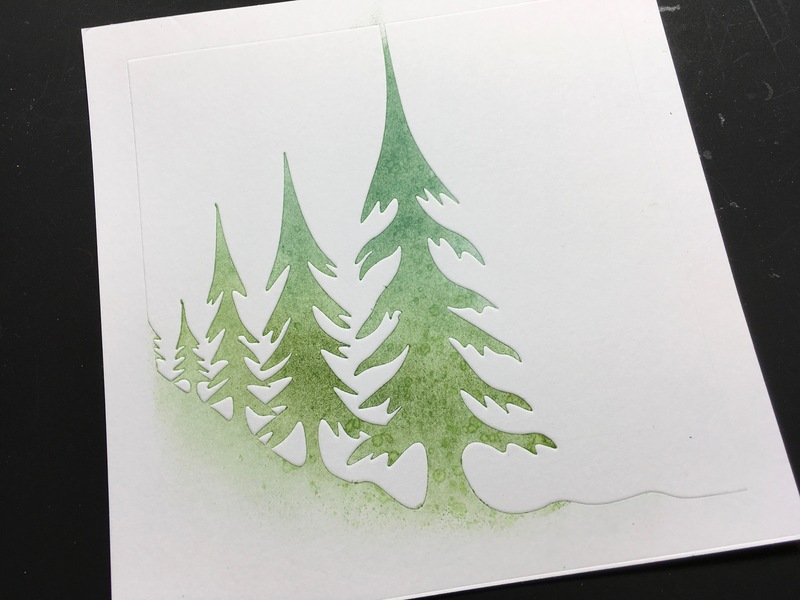 ….to a perfect pine perspective stencil in the space of an afternoon. (Jim went with square, which was fine by me!). And now they are already lasered, cleaned and packed. I love these people. We’ve worked together for many years now, Jim, Clare, Lisa, Steve – and they get it. They understand. It’s great working with people on the same wavelength. We will add this new stencil to ANY SUNDAY/MONDAY ORDER OVER £20 (after all your discounts). As I already said, if you put your order in early this morning and it was £20 +, you’ll receive the beautiful stencil too. Action Stations! And the top selling products? I was right to keep a few items back for today! 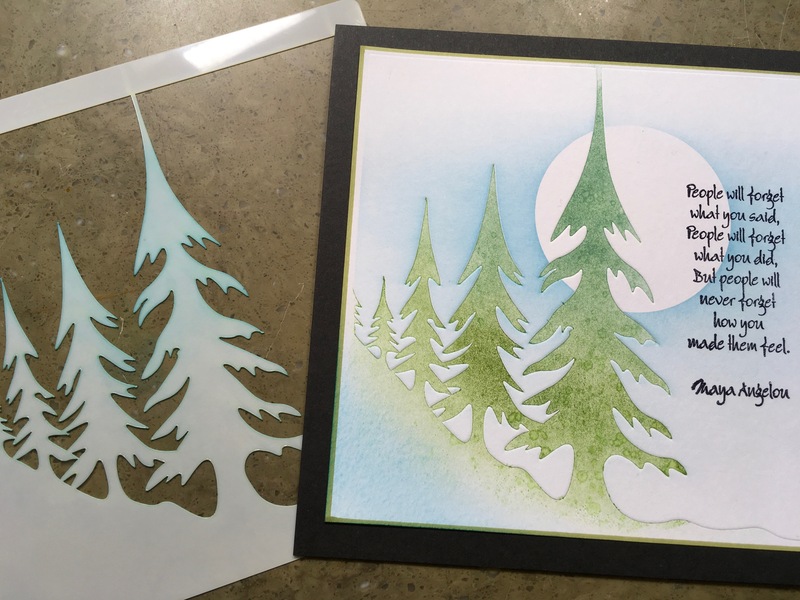 Fabulous stencil Barbara and you are so right about your team, they are amazing! My poor hands are now totally flat, from sitting on them for so long. I hope that will recover quickly, as I have a lot of Grooving to do today. I focus on Groovi usually, but I’ve been desperate to try some of the mixed media techniques that I’ve seen you, Maria and others demo and I’m very happy the sale has helped me invest in those items. Another order going in as this stencil will make a lovely addition. Thank you. Tempting though your free gift is I have already spent far to much and put my second order in yesterday after much deliberation . If only I had deliberated a little bit longer, should have remembered as got the free stencil last year. I am really pleased with what I am getting as got all I had my eye on and just a little bit more at such super prices as really is a fabulous sale. Can’t wait for my goodies to arrive but know I have to be patient just seeing the order number difference between my 2 orders shows how many in between. Your team must be working very hard to pack and refresh stock . Well done Clarity once again on such a Super sale. Going back in now and I might be some time!!! What a wonderful team! There were stamps I was umming and ahhing about (Carpe Diem being one) and, because I am feeling a bit low at the moment ( we had our very poorly cat put to sleep on Friday – the house is so empty – but I have ‘spares’ – all the cats in the neighbourhood!!). Your sale and offer of extra stencil has taken my mind off everything else. Thank you. I thought I would not buy anything else but did have a small list of consumables to hand. Decided I would add them if I ordered from Tina’s show on Thursday. Temptation get behind me I said. Went out for a walk in the Norfolk countryside this morning, lovely and sunny, not too cold. 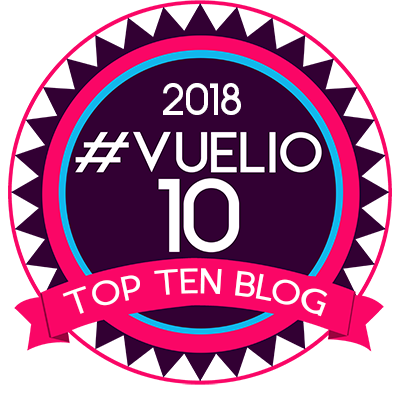 Got home, made a coffee, sat down to read the blog and guess what – TEMPTATION was there in front of me!!! Needless to say I will be placing another order this afternoon. Thank you, thank you, thank you for all you do for us Clarity addicts. You are so generous with you discounts and many of us are having fun browsing and ordering. Thank you so much. Thank you for the fantastic sale. 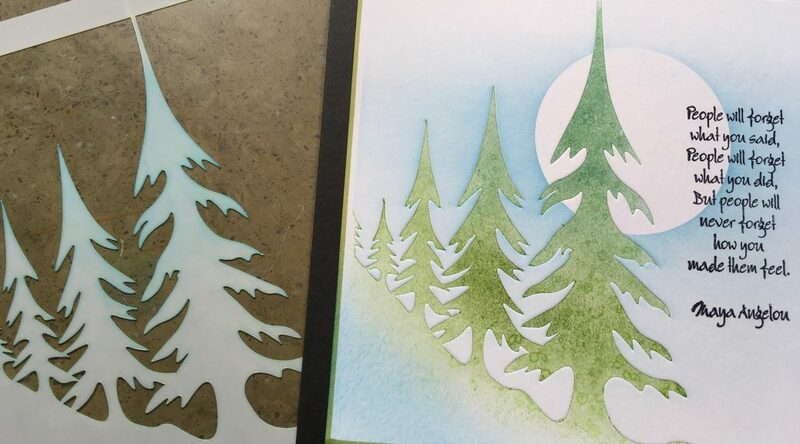 I have already sent in 2 sale orders so cannot justify a third, wish I had held on as I love the stencil. Will need to buy it at a later date for next year. You really do have a fantastic team. Two packs of paper arrived yesterday, so I now have all four, and I love them. You are such a fantastic artist and inspiration to us all. Must get down to Grooving Christmas cards now. Oh dear, there goes the kids’ inheritance! Again. Well, yes, it would be rude to turn down such a kind offer. As someone famous once said, ‘I can resist anything except temptation’. Got told off for placing yet another order. Showed hubby the lovely artwork with the stencil and I am now forgiven. However when they come on sale HE WANTS ONE!!! Men – they are impossible!! !